Guests who attend the event will be able to listen to live jazz music, purchase signature cocktails, and enjoy unlimited hors-d'oeuvres while mingling amid the sting rays, sharks, jelly fish and over 2,000 other forms of aquatic life. Food and beverage services will be catered in from the newly reopened restaurant inside Via Entertainment. 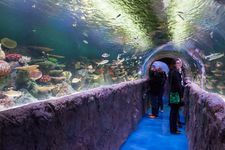 If this event goes well, Via Aquarium plans to host more after hours events on a monthly basis. The event is Friday, September 29 from 6-10 pm. Tickets are $50 ($40 if you're an aquarium season pass holder).